Great vacation property and location. Everything was great. However, it would be helpful to have instructions on using the TV remotes. There are three remotes, one for the fireplace and two for the TV. It took a half hour of trial and error to get the TV working. Loved the views. Clean, comfortable. Great for our family. Booking process, check-in and out process was very easy. We booked the Edgecliff house right before Labor Day and had a wonderful stay. The house is in a very good location and gets nice light in the big windows and on the deck. The Dollar Point Beach area was a pleasant surprise- it was great for the kids and we loved having lounge chairs and umbrellas to enjoy. We did not end up using the pool or tennis, but it looked great. The house is fairly well appointed for a rental, but could use a few minor things- like hooks to hang towels, and hangers in the closets. The main thing that would make the rental really top notch is if the owner invested in updating the bedding and some of the furniture. The sheets were ok, but the blankets and coverlets were old and dingy. However, overall the house was very clean. Everything was fine except the beds. The mattresses need to be replaced. Very uncomfortable. Some furniture was dated. We didn't watch TV, but flat screen tv's would be nice. Nice location and HOA was great. Home was clean and well stocked. 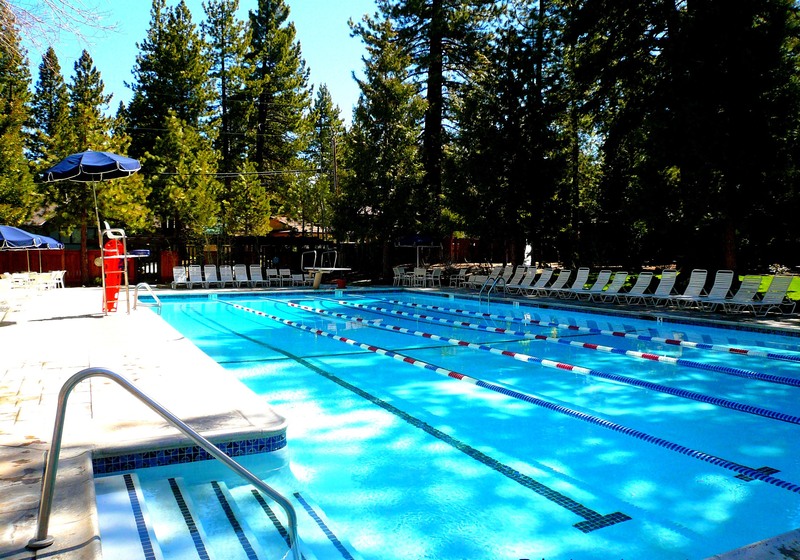 The location is central for our interests which are: a pool and dock for kids, close to Tahoe City and N Tahoe Park and beach in King's Beach, Incline Village and, of course, pii-wee golf. Overall, super nice place to stay, will definitely come back. Stayed here for 2 nights. There were 10 of us here and house was spacious and clean. Beautiful deck outside and view of lake. Will definitely come back and stay here. This house feels like home to us when we walk in the door. It is always clean and tidy. It has everything we need in a home away from home. The neighborhood is quiet, the views beautiful. Great location and amenities. Access to the pool and beach were fantastic. The house itself could use some sprucing up. It looks well used. Not all of the remotes worked and the fireplace wasn't worth the work it took to figure it out. Overall it was a good place to stay but could be a great place to stay if more effort was put in to make sure the property is kept up and the small conveniences are in working order. Property was as described- Beautiful view of the lake. Plenty of room and clean! The rental was good but first accommodations made it great! Very personable and just want to make sure you enjoy yourself. What a great place in a perfect location! If you like Lake Tahoe and want to see spectacular sunsets.....this is the place. 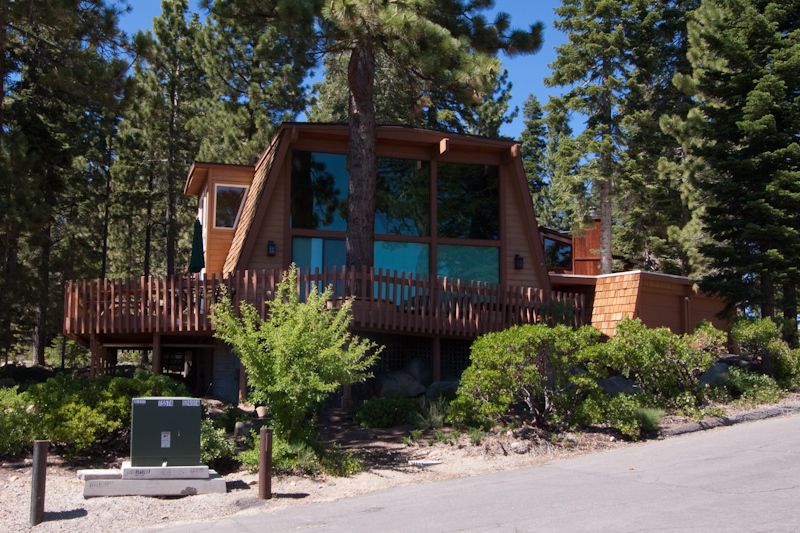 You are close to several great ski resorts and only a few minutes from Tahoe City. Great value! been more comfortable. Otherwise a perfect vacation! :) Thanks, WG. You can't beat the location or access to the beach. 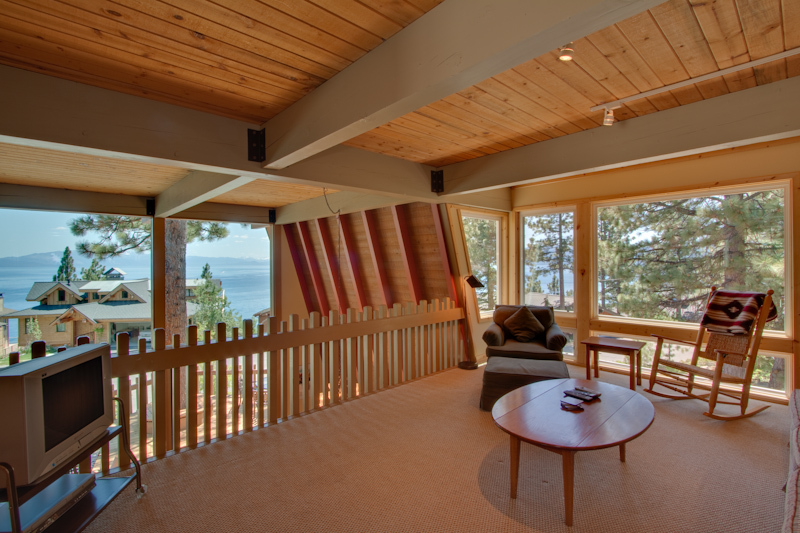 The house was comfortable and has wonderful views of the lake. The house furnishings could certainly use updating and things need to be throughly cleaned: kitchen items were dirty, comforter was soiled and carpets in the main room are stained. Checkout at 10am seems early. We love this home! This was close to our tenth year renting this home. 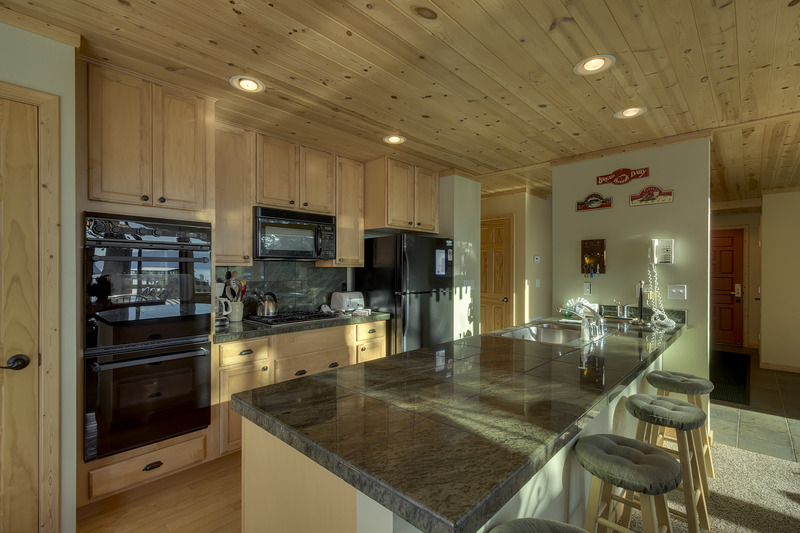 Great kitchen, living area, windows facing the lake, and a fabulous deck. It is also easy for seniors who prefer single floor living as there are two bedrooms on first floor. The house was very clean and confortable inside. It was nice that the carpets were shampooed before our arrival, but it was not nice that they were still VERY damp until the next morning. We couldnt put any of our bags on the carpet or even wear socks around most of the house due to the dampness. Other than that, the house was great, with fully stocked kitchen supplies, clean bathrooms, and bathroom supplies. The view of the lake was also spectacular. Getting to the lake definitely requires a car, and unfortunately the sand on the beach is more like roadbase. The house had some inflatable donuts, but i found all of them pretty much could not hold air and got soft rather quick. There was a raft but i never bothered with it since it had water inside the air chamber. Be warned the beach can get very windy so dont bother bringing your own beach unbrellas. The pool is more walkable and is clean with lifegaurds on staff. The tennis courts looked very nice as well. Minor things I would fix/change are to make sure the porch light works(timer battery was dead), change the toilet roll holder to securely hold the roll (instead of falling off every time you got a piece), have a small nightlight near the first step on the upper part of the staircase, and change at least the upper bathroom showerhead to be a wand-type head make it easier to shower/wash small children/babies. Wifi works well in the house on the first floor but the signal near the back and upstairs was rather weak. Also cell service can be spotty so plan on communicating with your group by email or voip as a backup. The house was beautiful with a nice lakeview. We love the open space with the loft on the second floor. You can have a v very nice view of lake tahoe in the morning. The kitchen has everything you need. Trent and Cynthia great to deal with, had issue with torn sheets, did bring over new set and extra dish towels, very accommodating. Just several suggestions...... need new shower curtains in upstairs bath, heavier to keep water out, new sheets for all beds, were not able to get fireplace started, didn't know if a battery issue, son in law read manual, and he is very adept in "how to"s". One light out in upstairs bath, tub area. The property at 305 Edgecliff Wy has a good view of the lake, a large wrap-around deck with nice furniture and houses 10 people easily. The house was was very clean, well-maintained, and VERY well stocked with dishes, eating utensils and cooking pans. There is a second fridge in the garage for additional food storage. 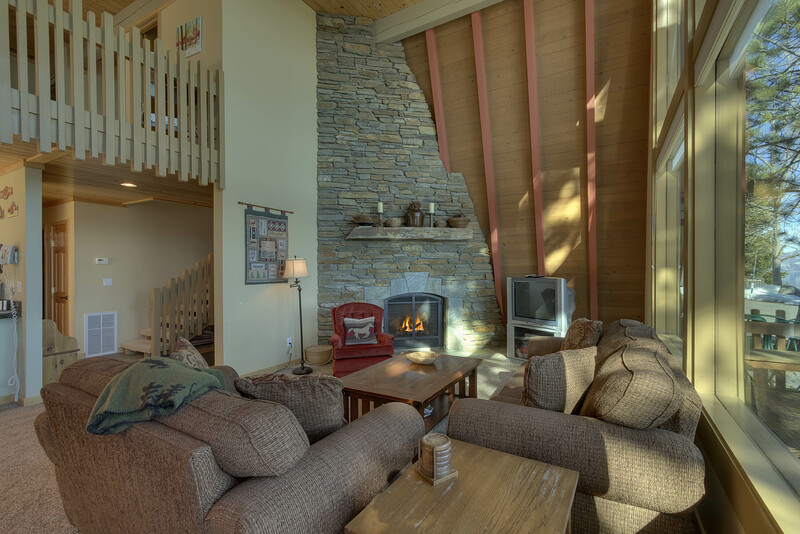 Management provided an accurate description of the property and communicated well with us. The star amenities are the beach, pool, tennis courts and game equipment that go with the house. Hint: be sure to close the garbage box securely; a bear batted ours open and had a high old time feasting on our leftovers! Rental was acceptable but not anything special. Beds were ok, but not great. Lots of noise from 2nd floor down to first floor. Fold out couch in loft was not comfortable at all. Would only recommend for 8. When renting didn't realize how far away beach access and pool access was. No good description/map provided to either location but figured out anyway.Otherwise, acceptable rental. I'd like to rent the same property again this summer. Who can I talk to regarding availability and rates? This was a beautiful place to stay and despite the ants in the house I'd stay again. It is a bit pricy but the views make it worth while. Great house, great location, beautiful views, great vacation! This is a great house for a medium sized group- in an excellent location. 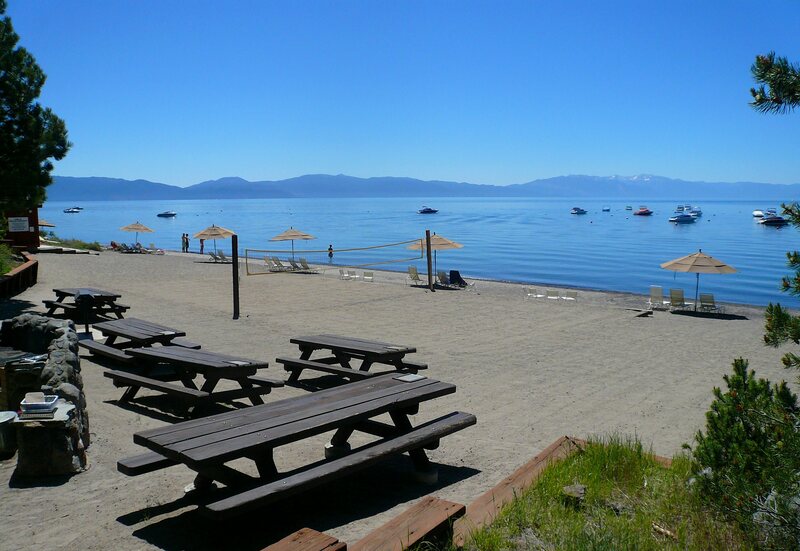 Not only are you close to Tahoe City, you're only 1/2 hour drive from Emerald Bay and Incline Village and Sand Harbor Beach. You're also 15 minutes from Squaw and Alpine. The private beach and pool with tennis courts at each were also great and used frequently by our group. The house is open (not dark like some Tahoe houses can be) and very comfortable. I would recommend this house to anyone. The views of the lake are incredible. The location is very accomadating, just a short drive to everywhere we wanted to go. We took advantage of the pool area and the private beach. It was everything it was advertised to be. We enjoyed our stay at your property. We loved the location and the view was wonderful--loved the deck furniture and gas bbq. We would definitely book again. Everything was beautiful! 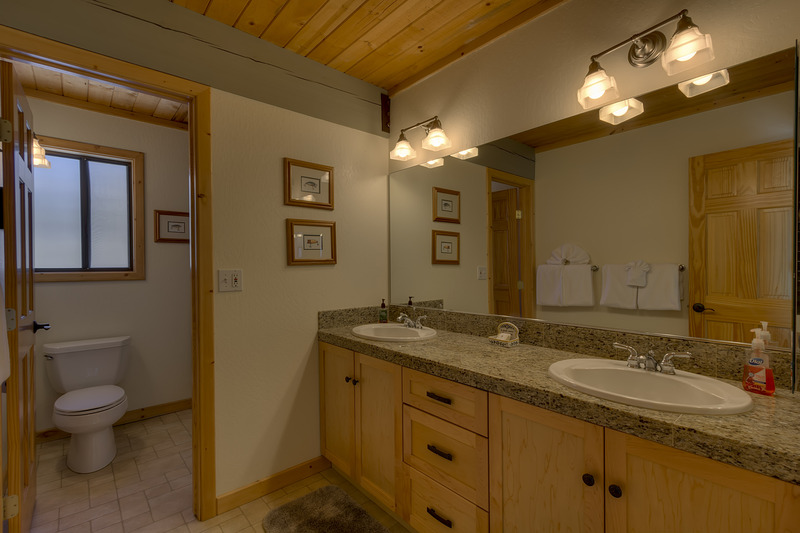 The location of the cabin was great and all of the amenities added to our week-end. The only problem we had was that the garbage was full and so we had to leave our bags of garbage in the garage. No biggie! Thanks for a great week-end. This is a great spot for a group of 10. The deck is awesome. The kitchen is great if you like to cook. The common space is awesome for a big group! !I've been here three times in the last year. 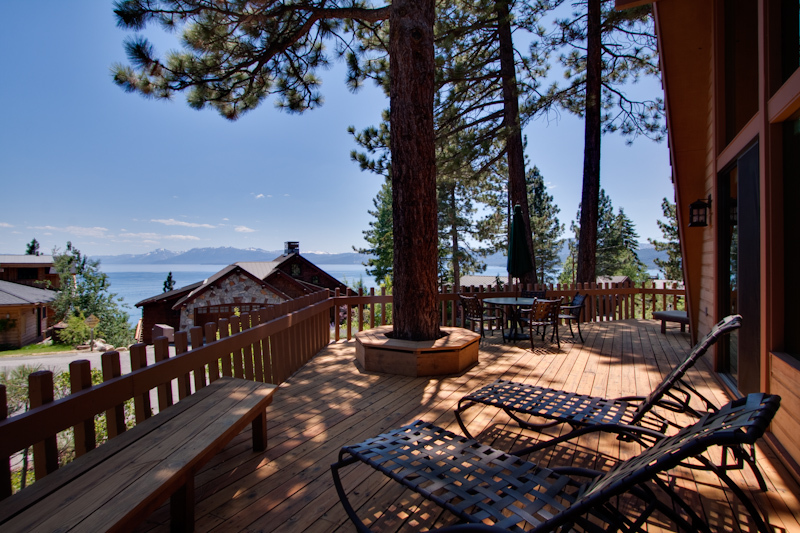 We enjoyed barbecuing, dining and lounging on the spacious deck which had a great view of Lake Tahoe. The private beach was great for the kids. The pool was good also, a little chilly though. Shopping and downtown are a close by. Horseback riding, river rafting and so much more is just a short drive away. Watch out for the sofa sleeper, the springs make this not a bed anyone wants to sleep on. Overall a great vacation! The house was fantastic. The view was beautiful and it was in a great location. The property manager was very helpful. I would recommend this property to anyone. Property was exactly as advertised. Everything worked well. Views were very nice. it was a great experience for all members of my family, and we all agree that we gonna come back!!!! My only complaint is that the deck patio furniture were covered in pine needles when we arrived. Really good for company of friends, no master bedroom though. Second floor has big 2 sink bathroom. Bedrooms comfy, not huge in size, but decent. Overall everything looks nice, great location. Great rental. We always have a wonderful time. My only other comment is the downstairs master bedroom needs a new mattress. It is really soft for two people. The driveway needs shoveling and was very icy. The toaster does not work properly and you have to unplug it to get the toast to pop up. The remotes need batteries and the fireplace batteries are dead so you have to turn it off manually. I would suggest the own owner leave a few trash bags as there were none and just for helpful information the coffee filters did not fit the machine. I purchased some and left them for the next renter. These are small items and our stay was very nice. The cabin was great! We had a total of 10 people and there was plenty of room for all. Had some great views from the deck and upstairs balcony. Will come back next year. overall, this place is great but I think it was abit over priced. 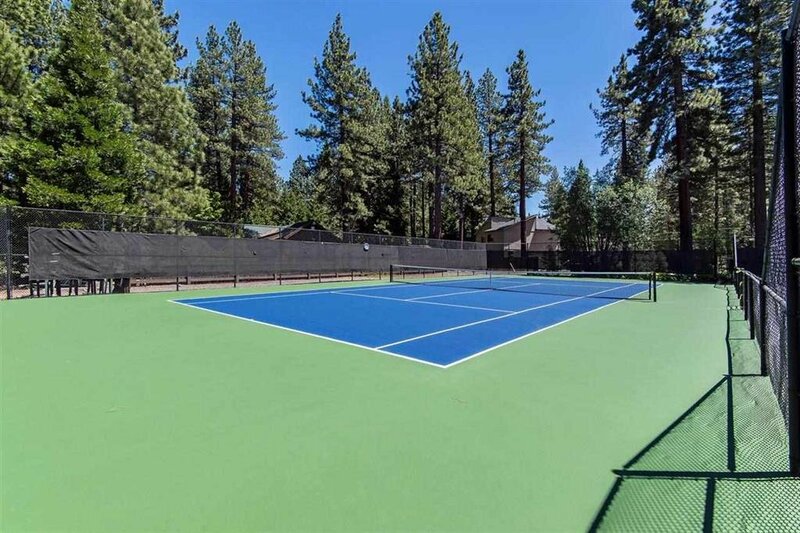 The location has a good view to the lake but not close to the pool or tennis court or to the private beach at all. It's a very short drive but a bit far for walking. Kitchen was very nice, has everything. The rooms were abit small, just enough for 2 twins with just enough walking space. Manager was helpful and available at all time. The home was in a good location with a beautiful view of the lake. It was clean and in good condition. 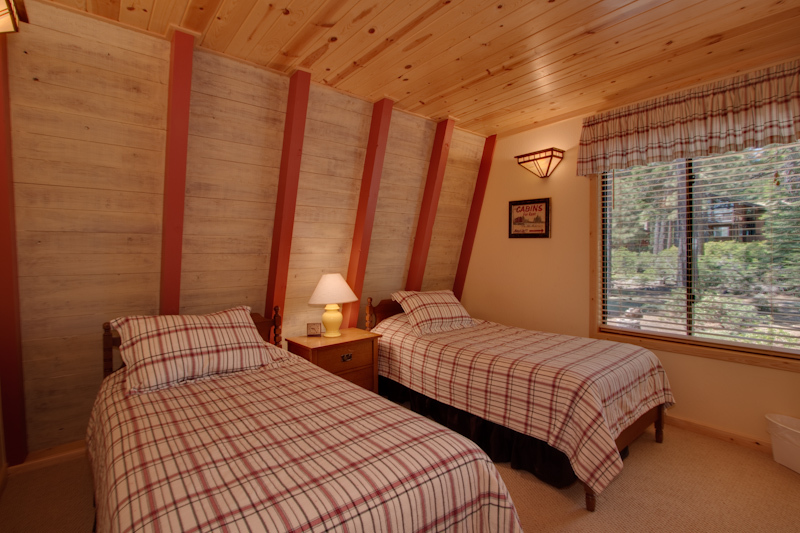 The linens were not in the best shape - upstairs twin beds had flannel sheets and beds were not comfortable. Pillows should all be replaced. In general, alot of the furniture could be upgraded. The kitchen cupboards were full of stuff that was not organized at all. Someone needs to clean and purge the kitchen. everything was perfect except that we all expected to have internet wifi access so we could broadcast our wedding live with relatives that were not able to make it. This was a great place to stay, with a very good view of the lake. The neighborhood was very quiet, and the neighbors were very friendly. Great place to stay!